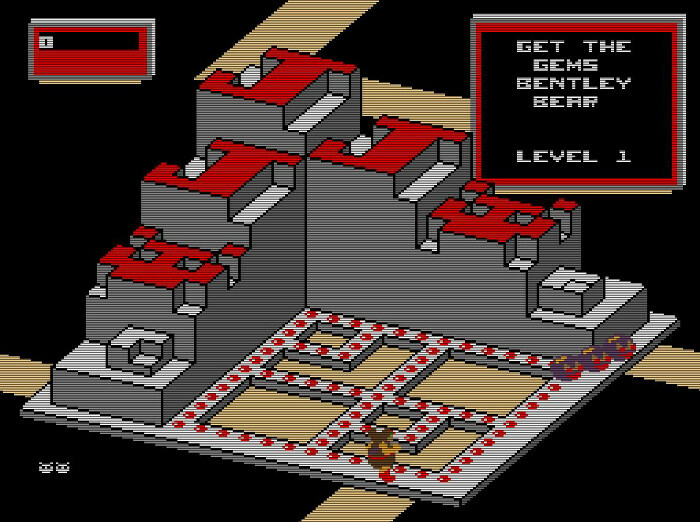 I can’t blame folks in 1983 for thinking Atari’s arcade hit Crystal Castles was incredible. Its isometric viewpoint made great use of its limited resolution, presenting a tangible 3D environment. Plus, you can tell a good deal of work went into its character designs and animations; just look at how much detail there is on the dancing skeleton in the above image or the game’s red-shoe-wearing protagonist Bentley Bear. Its gameplay holds up too. While navigating the narrow pathways can be a little finicky with the arcade cabinet’s trackball, Bentley handles smoothly enough that players will advance further and further into the game as they memorize layouts and practice the required movements. And there’s a satisfyingly crunchy low-bit noise when Bentley collects the gems that are scattered across each level. Even today, it’s a tremendous amount of fun. One of my favorite details (one that goes unnoticed by most players, I’d bet) is that the steps in the background of the first stage will spell out the initials of the top scorer, both horizontally and vertically. Bentley is just a barely (no pun intended) recognizable, pitifully distorted silhouette. The shiny round gems of the arcade version are replaced by thin lines, making it difficult to understand what exactly you’re trying to collect. 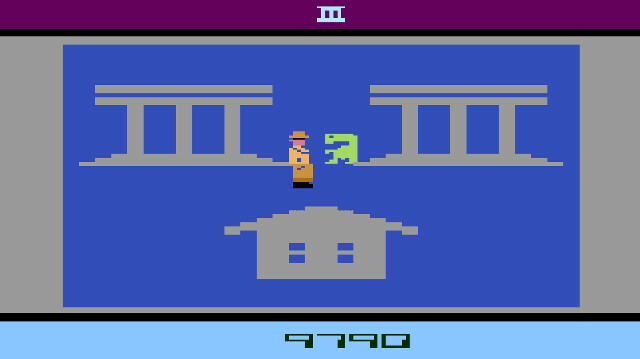 Bentley controls as if he’s moving through a thick, deep mud, leading to frustrating failures at the hands of enemies that should have been easily avoided. Of course, there would be more ports later on. While there’s a great deal of variety among them, all of them do a better job than the 2600 version’s attempt. Of course, all of this criticism comes from a modern perspective. Crystal Castles didn’t receive the hatred that some of its contemporaries did, and it’s considered miles better than ports like Pac-Man and Donkey Kong or sloppy licensed games like E.T. the Extra-Terrestrial. In fact, it was pretty well received and is still beloved by many. 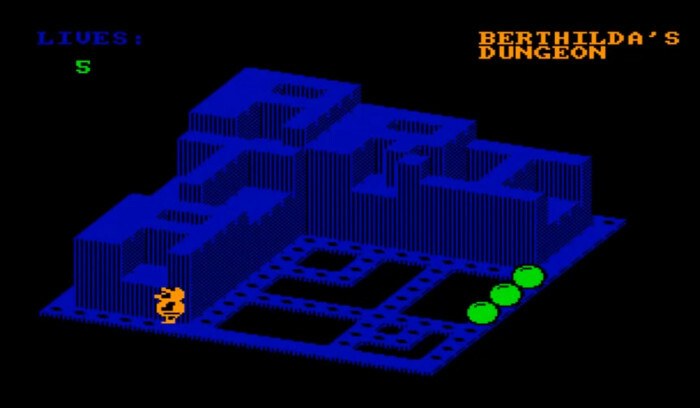 (A review on GameFAQs calls it “One of the best Atari 2600 games in many ways.”) It was a rare attempt at portraying a 3D space on a console that was simply not powered to do so. 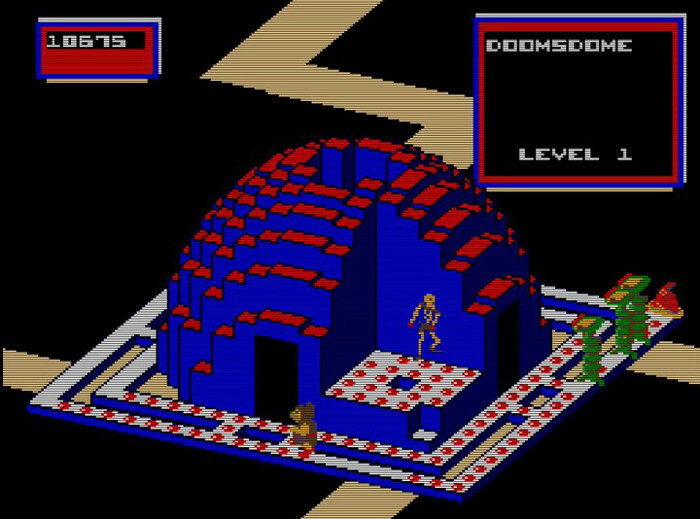 You could argue that Robot Tank did this better, but even so, Crystal Castles was pushing the 2600 pretty hard, accomplishing something that many people would have said was impossible. Crystal Castles doesn’t really look all that bad, does it? 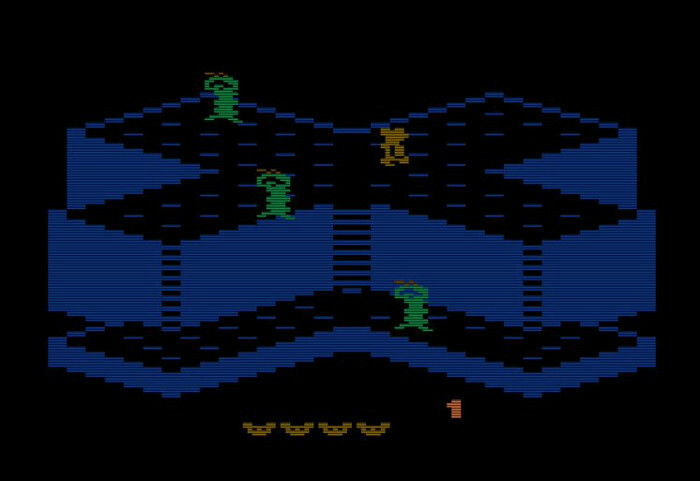 So, while the arcade version of Crystal Castles is better (far, far better in my opinion), the Atari 2600 version shouldn’t necessarily be overlooked just because it suffered a considerable downgrade in transition. It was, after all, a pretty advanced piece of software in its own right.